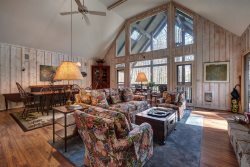 When William McKee founded McKee Properties in 1977, his vision was to help other people build the lifestyles they envision in the Cashiers area. Beginning as a boutique real estate firm, McKee Properties has grown to be the area’s leading broker of premier properties. Over the past 40 years, we have evolved to meet the demands of the market, yet we remain firmly grounded in our founding philosophy: we can and will meet the individual needs of each client while preserving what makes the Cashiers area special. The McKee family legacy in western North Carolina began in the mid 1800s when William Allen Dills founded the town of Dillsboro. Today, McKee Properties has set a high standard for innovative and responsible development with award-winning projects such as Wade Hampton Golf Club, Cedar Creek Racquet Club, Straus Park, Chestnut Square, Arrowhead, Snowbird, Little Sheepcliff and Sassafras Ridge. McKee Properties takes a leading role in its representation of the listing and sales of properties of excellence throughout the area. We call Jackson County home too, as our founding family has done for generations. And we believe that a healthy, vibrant surrounding community provides the foundation for a sustainable, thriving mountain lifestyle. The McKee Properties team has a long history of community involvement, working to benefit the residents of Jackson and Macon Counties now and for generations to follow.